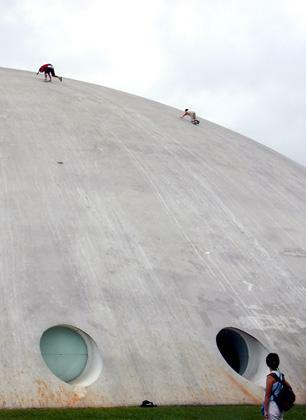 Since its construction in 1954, the Oscar Niemeyer-designed Lucas Nogueira Garcez Pavilion in São Paulo’s Ibirapuera Park has been used as a playground by adventurous youths. Known locally as the , or “hut,” the pavilion contains a museum and exhibition space, but receives the most attention for its roof, ideal for sliding. While signs prohibit park visitors from climbing on the dome, and police are quick to chase them away, the concrete surface is irresistible. Nearby is Niemeyer’s marquise, an enormous concrete roof designed to connect the different pavilions in the Ibirapuera Park, which is a haven for in-line skating and bicycling. Oscar Niemeyer is an architect based in Rio de Janeiro, and laureate of the Pritzker Prize in 1988. His works are known for their smooth and playful curving forms. Ibirapuera Park was designed in collaboration with the landscape architect Roberto Burle Marx.